DVD to iPod Converter - Free Download ! New type software has been unveiled to the market for converting the DVD quality movies to iPod format. 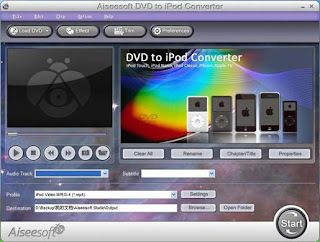 The name of this software provider is Aiseesoft DVD to iPod Converter, which provides some high quality options to customize the file, Movie Trimming, DVD video effect, subtitle selections, and Audio track selection. You can download this software and enjoy the music. You can have this software completely free. 1.Conversion of DVD to /H.264/M4A/AAC/MP3 MP4, H.264, MP3, M4A and AAC. These format can support your iPod Touch/Nano/Classic, iPhone, iPhone(3G) and Apple TV. 2.This provides some features to edit our video effect and to trim any segment from your DVD as you can. 3.You can give subtitle to your output file and you can select audio track easily. 4.You can trim the video by applying the start time and video time to pictures. 5.Adjusting the Resolution, Video Bitrate, Frame Rate, Audio Channels, and Sample Rate is very easy with this software. 6.Previewing the edited video is very possible with this software. 7.For copying and ripping the videos, just few clicks are needed. 8.Provide the fastest conversion speed (>400%), completely support dual core CPU.